Warranty Direct backs What Car? Awards | What Car? What Car? 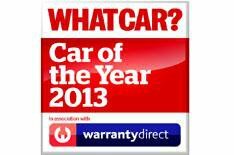 has announced that Warranty Direct will be headline sponsor of the What Car? Car of the Year Awards 2013, which will be held on January 9. Warranty Direct will also sponsor the City Car category. The What Car? Car of the Year Awards are the most coveted accolades in the automotive industry. The Awards are presented to cars that set the highest standards in their sector after being put through the toughest, most rigorous tests by the most experienced team in the business. The benefits of the sponsorship deal includes the alignment with the most authoritative and trusted brand in motoring, brand positioning and awareness, extensive PR opportunities, networking and brand association to the awards via a multi-channel promotional campaign. The What Car? Car of the Year Awards event is attended by more than 1200 leading industry figureheads alongside the most influential motoring correspondents from the wider media. The event is to be held at the Grosvenor House Hotel in London on January 9, 2013.